Back Bay Books, 9780316086370, 384pp. A family living in a makeshift shanty in urban Kenya scurries to find gifts of any kind for the impending Christmas holiday. A Rwandan girl relates her family's struggles to maintain a facade of normalcy amid unspeakable acts. A young brother and sister cope with their uncle's attempt to sell them into slavery. Aboard a bus filled with refugees-a microcosm of today's Africa-a Muslim boy summons his faith to bear a treacherous ride across Nigeria. Through the eyes of childhood friends the emotional toll of religious conflict in Ethiopia becomes viscerally clear. Uwem Akpan was born in Ikot Akpan Eda in southern Nigeria. After studying philosophy and English at Creighton and Gonzaga universities, he studied theology for three years at the Catholic University of Eastern Africa. He was ordained as a Jesuit priest in 2003 and received his MFA in creative writing from the University of Michigan in 2006. "My Parents' Bedroom," a story from his short story collection, Say You're One of Them, was one of five short stories by African writers chosen as finalists for The Caine Prize for African Writing 2007. 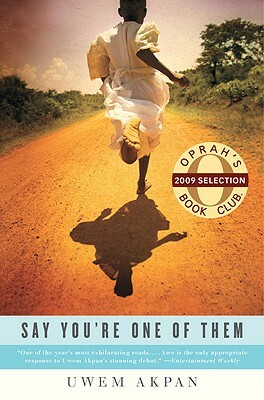 Say You're One of Them won the Commonwealth Writers' Prize for Best First Book (Africa Region) 2009 and PEN/Beyond Margins Award 2009, and was finalist for the Los Angeles Times Art Seidenbaum Award for First Fiction. In 2007, Akpan taught at a Jesuit college in Harare, Zimbabwe. Now he serves at Christ the King Church, Ilasamaja-Lagos, Nigeria. finds the wide readership it merits." "All five of these stories are electrifying. "—Maureen Corrigan, NPR's "Fresh Air"
Each of the stories in Say You’re One of Them is told from the perspective of a child. Do you think this affected your reaction? If the narrators had been adults, might you have felt differently about the stories? Why do you think Akpan chose to depict these events through children’s eyes? How do Akpan’s young characters maintain innocence in the face of corruption and pain? In "An Ex-mas Feast," Maisha leaves her family to become a full-time prostitute. Do you think she chose to depart, or did her family’s poverty force her to flee? Is it possible to have complete freedom of will in such a situation? Is it reasonable to judge a person for her actions if her choice is not entirely her own? In "Fattening for Gabon" the children’s uncle and caretaker, Fofo Kpee, sells them into slavery. How does Fofo’s poverty and vanity contribute to his unthinkable actions? Do his pangs of conscience redeem him for you? Why or why not? In "What Language is That," Hadiya and Selam are kept apart by their parents after the escalation of religious conflict. Have you ever experienced a situation in which friends and family have objected to someone in your life for reasons you didn’t understand? What did you do? How did you feel? The bus in "Luxurious Hearses" is a microcosm not only of African hierarchies and religions but also of the continent’s numerous languages and dialects. Discuss how speech is related to class, culture, religion, and heritage. How does dialogue function in the other stories? Do we hold similar attitudes about language in our own culture? What are some examples? This book takes its title from instructions given to a Rwandan girl by her mother in "My Parents’ Bedroom." Did the familiar domestic detail in this story—Maman’s perfume, little Jean’s flannel pajamas, toys like Mickey Mouse in the children’s room—intensify for you the horror of what ensued? Is there comparable detail in any of the other stories that helped you to identify with Uwem Akpan’s characters? Although the stories in Say You’re One of Them are fictitious, the situations they depict have a basis in reality. How do the emotions you feel when reading these stories compare to your emotions when reading accounts in the news media of similar atrocities? Has reading Say You’re One of Them changed the way you think about these issues? Uwem Akpan addressed his other vocation in an interview, saying, "A key Vatican II document makes it very clear that the joys and anguish of the world are the joys and anguish of the Church." While reading these stories, were you ever reminded that this writer is also a Jesuit priest? Does Akpan’s subject matter seem to you to be imbued with religious values? In what ways? Do the drama and power of the Akpan’s fiction call forth any biblical stories for you? If so, which ones? Some of the children in Say You’re One of Them are not poor. What are the particular obstacles these children face that are not issues in your own country? Are there challenges other than poverty with which you can identify? Do the family dynamics feel familiar to you? The poet and memoirist Mary Karr wrote that Uwem Akpan "has invented a new language—both for horror and for the relentless persistence of light in war-torn countries." Did you find any beauty or goodness in these tragic tales? If so, offer some examples.